NemesisV: Old man stealing from the Recycle Bin! On one hand we try to recycle all the papers, bottles etc... There are nice bins for us to put those in so that they are recycled... But what wrong here? 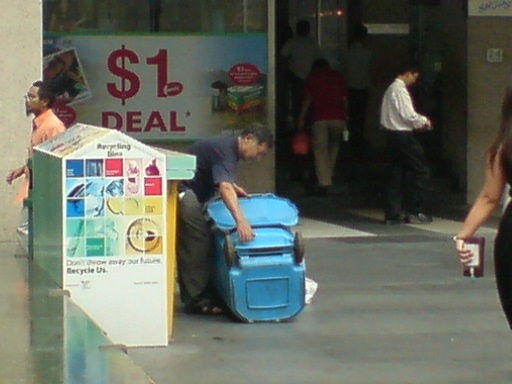 In the middle of Raffles Place MRT, this man is taking all the paper out of the bin. And guess what, he leaves the rest alone. That clearly tells us this man is NOT the collector for the bins! He collects alright, but for his own profit! He is making all of us a fool and a tool for his profit. We recycle, he make money out of it. Well, he might not even recycle it at all. Someone will say, sure we dun want them anyway, whats wrong with letting him have it? EVERYTHING is wrong. The recycle company will not be able to collect their recycle item and as a result lost of revenue. This is exactly why everyone does not want to recycle. Its costly, labour intensive and now we have scavenger like this stealing the stuff. This is same as the galan guni who steal the recycle bags! Well, to think that I will be make use by this old man, I say I rather now recycle. Lets us all burn in hell then.